To San Andres on the "Ships starting with S" page. Built by J & K Smit's Scheepswerven, Kinderdijk, Holland in 1921. According to this external page, she was launched that year as San Andres for D/S A/S Otto Thoresens Linie (Otto & Thor Thoresen A/S), Kristiania. Delivered in Dec.-1921 to A/S Ganger Rolf (Fred. Olsen & Co.), Kristiania, then transferred in 1938 to Den Norske Middelhavslinje A/S (Fred. Olsen & Co.), Oslo. Captain: H. Hansen (this name was obtained from the original convoy document for Convoy HGF 32 - see below). June 6 Weymouth Bay London June 10  (See also Page 1). June 18 Southend Falmouth June 19 OA 170 Again, see also Page 1 above. June 27 Falmouth   OA 174 Dispersed June 28. Aug. 2 St. John's, N.F. Botwood  Independent Page 1 gives arrival Aug. 3. Oct. 1 St. John's, N.F. Botwood Oct. 6* Independent *Page 1 gives arrival Oct. 3. Oct. 13* Botwood New Orleans Oct. 17 Independent *Again, see Page 1. *This entry is in the wrong place. It belongs under 1942 and has been inserted there. Oct. 25 Liverpool   OS 10 Detached independent Nov. 15. March 24 Liverpool Bathurst Apr. 9 OS 23 For Bathurst. May 31 Milford Haven   OS 30 Detached June 10. July 7 Curacao Key West* July 14* TAW 2C Curacao to Kingston. (stop at Gitmo not mentioned, Page 3). Sept. 11 Liverpool New York City Sept. 25 ON 129 Convoy will be added. Oct. 11 Gitmo Puerto Plata Oct. 13 GAT 13 Gitmo to Puerto Plata. Apr. 15 Clyde   OS 46/KMS 13 For Bathurst. Convoy rendezvoused with MKS 14, June 11. June 11 SL 130 & MKS 14 joined up   SL 130/MKS 14 Detached w/SL 130F, June 18. July 10 Loch Ewe New York City July 22 ON 192 Convoy will be added. Aug. 27 Gitmo Ciudad Trujillo Aug. 29 GAT 83 Gitmo to Ciudad Trujillo. Sept. 22 New York City Liverpool Oct. 6 HX 258 Convoy will be added. Oct. 18 Liverpool New York City Nov. 4 ON 207 Convoy will be added. Nov. 19 New York City Loch Ewe Dec. 3 HX 267 Convoy will be added. Dec. 26 Loch Ewe*   OS 63/KMS 37 *From Oban. 1944 Jan. 7 Convoy split Dakar Jan. 17* OS 63 *Page 5 gives Jan. 15. Febr. 4 Dakar   SL 148 3 Passengers, 10 Mails, Dakar to UK. Rendezvoused with MKS 39, Febr. 12. 1945 Jan. 21* Tyne N Shields Jan. 22* FS 1704 Put back. Jan. 26 Downs(*)   OS 107/KMS 81 *Southend. Jan. 30 Convoy split Gibraltar Febr. 5 KMS 81G Convoy will be added. Apr. 19* Sydney, N.S.W. Manus May 28 Independent *Page 5 gives departure May 19. For information on voyages made in between those mentioned here, please see the documents received from the National Archives of Norway and A. Hague's Voyage Record above. Follow the convoy links provided for more details; several Norwegian ships took part. As can be seen when going to Page 1 of the archive documents, San Andres had arrived Seville from Norway in the spring of 1940. In May, she's listed in station 82 of Convoy HGF 32 from Gibraltar to the U.K., bound for Portland and London with potatoes, sailing right next to Torfinn Jarl. She arrived Portland on June 6, London June 10 and later that month we find her in Convoy OA 170, which left Southend on June 18, but she was only bound for Falmouth on that occasion. (Ref. external link provided in the Voyage Record). Shortly thereafter, she was one of several Norwegian ships transporting Norway's gold across the Atlantic (see my page about M/S Bomma). For this voyage, the external website that I've linked to in the table above has her in Convoy OA 174 (left Southend on June 25, dispersed June 28), and the webmaster of the site has sent me the following note, presumably from the Commodore's notes: 'At 1630, 27th June, I closed "San Andres" and embarked Mr. Mossigen as directed in your signal timed 1247, 27th June. He was reluctant to leave San Andres and explained that he was acting directly under the orders of the Norwegian Government and that he felt considerable hesitation in obeying instructions from any other source. It was not difficult to appreciate this hesitation when Mr. Mossigen explained that he was in sole charge of San Andres's cargo which consisted of gold bullion to the value of £1,250,000'. (In today's money, this is estimated to be about 18,000,000 pounds, or 33,000,000 dollars). According to Page 1, San Andres arrived Halifax on July 8-1940 (having started out from Falmouth June 27), proceeding to Quebec that same day, with arrival July 11 - perhaps that's where the gold was deposited? The rest of her 1940 voyages are listed on Page 1 and Page 2, the latter document also showing her 1941 voyages. It'll be noticed that she appears to have spent quite a long time in New York, where she had arrived from Boston on Febr. 25-1941. Departure is given as May 15 when she proceeded to Hampton Roads. In his record above, A. Hague mentions a grounding at the end of 1940; I have no further details on this and don't know whether her long stay in New York had anything to do with that, but it's possible repairs had been necessary. Skipping now to Sept. 22-1941, when we find her in station 105 of Convoy HX 151 from Halifax to the U.K., together with the Norwegian Sama (station 85), Dagrun (54), Meline (43), Morgenen (93), Belinda, Thorshøvdi (53), Sophocles, Tigre (44), Hardanger (94), Leiv Eiriksson (24), and Laurits Swenson. The convoy arrived Liverpool on Oct. 7, but San Andres, cargo of flour, stopped at Belfast Lough on the 5th, later proceeding to Bristol, where she arrived Oct. 10. She can now be found in Convoy OS 10, departingLiverpool on Oct. 25 (station 32). She had a cargo of explosives. Again, follow the link in the Voyage Record for more convoy details. Other Norwegian ships mentioned are Fana, Somerville and Rio Verde. This was a Freetown bound convoy, but San Andres was bound for Bathurst, RG, where she arrived on Nov. 16, having detached from the convoy the day before, according to A. Hague. Page 2 has her subsequent voyages. With a cargo of W.A. produce, she later returned to the U.K. in Convoy SL 99, which departed Freetown on Jan. 27-1942 and arrived Liverpool Febr. 16, again with other Norwegian ships in company (link in Voyage Record). After having remained in Liverpool for several weeks, she joined Convoy OS 23, which left Liverpool March 24 and arrived Freetown Apr. 11. San Andres, however, was again bound for Bathurst (station 34), where she arrived Apr. 9. She headed back in the other direction with Convoy SL 108/SLF 108, which sailed from Freetown on Apr. 26 and arrived Liverpool on May 19. She was in the fast section (SLF), station 14, her voyage is given as Bathurst-Clyde, cargo of groundnuts (A. Hague says her cargo consisted of iron ore - re. link to his listing in the table above). According to Page 3, she stopped at Belfast Lough on May 16, later continuing to Avonmouth, where she arrived May 19. In June that year, she's listed in Convoy OS 30, voyaging in station 14 from Milford to La Guaira, via Trinidad for bunkers. This was also a Freetown bound convoy, but according to A. Hague, she was detached around June 10; she arrived Trinidad on June 23, La Guaira June 28 (cargo of patent fuel, station 14), proceeding to Curacao early the following month. Her subsequent voyages are shown on Page 3 above; convoy information for some of these can be found in A. Hague's Voyage Record. On Aug. 9-1942, I have her in station 45 of the Halifax-U.K. Convoy HX 202, bound for Mersey with a cargo of sugar, sailing next to 3 other Norwegian ships, namely Montevideo, Heranger and Hindanger (other Norwegian ships also took part, as will be seen when following the link. It'll also be noticed that San Andres is mentioned in the Commodore's notes). All 4 of them are also mentioned in the westbound Convoy ON 127, leaving Liverpool for New York on Sept. 4, in which several Norwegian ships were torpedoed; however, there's a minus next to her name, which probably means she did not sail - she's not included in A. Hague's listing for ON 127. Instead, he has her in Convoy ON 129*, which left Liverpool on Sept. 11 and arrived New York on the 25th, and this fits better with the details found on Page 3. She later returned across the Atlantic in Convoy HX 215, which departed New York on Nov. 11 and arrived Liverpool on the 25th. San Andres again had a cargo of sugar and was bound for Clyde, where she arrived on the 25th. With destination Cuba, she was scheduled for the westbound Convoy ON 153 on Dec. 11 (Bello and others were sunk; follow the links for details), but did not sail (A. Hague indicates she did join but returned to port). She instead joined Convoy ON 157 later that month and arrived New York on Jan. 15-1943. The Norwegian Skiensfjord served as the Commodore Ship for this convoy. In Febr.-1943, she's listed, with a cargo of sugar for Greenock, in station 34 of Convoy HX 228 in which Brant County was sunk. Please follow the link for much more information on this convoy; a cruising order/Commodore's notes and several reports are available and there's also an analysis of attacks. In Apr.-1943, she shows up in convoy OS 46/KMS 13, voyage Clyde-Bathurst with stores, station 95. This convoy originated in Liverpool on Apr. 15 and split up on the 24th, the KMS convoy* arriving Gibraltar on Apr. 26, while the OS convoy continued to Freetown, where it arrived May 3. San Andres (in the OS convoy) arrived Bathurst on May 1 (having sailed from Clyde on Apr. 15), returning to the U.K. with Convoy SL 130/MKS 14. The SL portion had started out in Freetown on May 30 and arrived Liverpool on June 21, having joined up with MKS 14* from Gibraltar on June 11. San Andres had a cargo of groundnuts, voyage Bathurst-Loch Ewe (SL portion); she had left Bathurst on May 30 and arrived Loch Ewe June 20, having stopped at Dakar on the way. Her voyages in this period are shown on Page 4 - more convoy information can be found via the links provided in the table above; other Norwegian ships also took part. She subsequently made another voyage to New York, having joined Convoy ON 192*, which originated in Liverpool on July 9-1943 and arrived New York July 22 (Commodore in Laurits Swenson). San Andres had joined from Loch Ewe, and now remained in New York for almost a month. According to A. Hague, she later went back to the U.K. in Convoy HX 258*, departing New York on Sept. 22, arriving Liverpool Oct. 6. This convoy is not yet available among the HX convoys included on my website, but will be added. She returned to New York again in Convoy ON 207*, leaving Liverpool on Oct. 18, arriving New York Nov. 4, and later that month, A. Hague has included her in Convoy HX 267*, departing New York Nov. 19, arriving Liverpool Dec. 3; San Andres stopped at Loch Ewe that day (Page 4). She can now be found in Convoy OS 63/KMS 37, voyage from Oban to Dakar and Bathurst in ballast in station 114 of the convoy, which left Liverpool on Dec. 25-1943 and split up Jan. 7-1944, the KMS convoy* arriving Gibraltar on Jan. 7, while the OS convoy continued to Freetown, with arrival there Jan. 17. As already indicated, San Andres (in the OS convoy) was bound for Dakar and Bathurst, arriving Dakar on Jan. 15, Bathurst Jan. 18 - she had started out from Oban on Dec. 26. 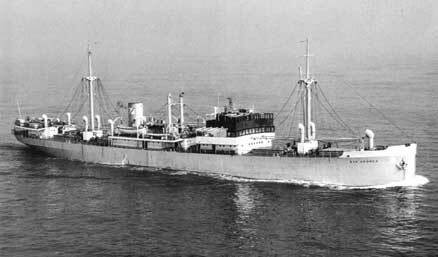 She later returned to the U.K. in Febr.-1944 with Convoy SL 148/MKS 39, cargo of groundnuts, mail and 3 passengers, voyage Dakar-Barry Roads. SL 148 had originated in Freetown on Febr. 1, joined up with the MKS portion* from Gibraltar on the 12th, and arrived Liverpool on Febr. 24. More convoy information is available via the external links provided in the Voyage Record, while San Andres' departure and arrival dates/ports are shown on Page 5 of the archive documents. As will be seen, there's a big gap in her voyages, from March 22-1944 to Jan. 15-1945 - I'm not sure what the reason is for this long stay at Tyne. She was scheduled for Convoy OS 106/KMS 80*, which left Liverpool Jan. 22-1945 (ref. external link at the end of this page), but instead joined the next convoy, OS 107/KMS 81, originating in Liverpool on Jan. 27. 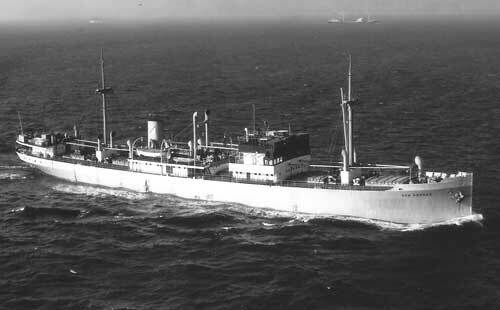 San Andres was on a voyage from Southend to Suez and Bombay with sulphate of ammonia in station 63 (KMS convoy*). Again, see Page 5 above for info on her departure and arrival dates. The Norwegian Acasta also took part in this convoy. Page 5 also lists some 1946 voyages, while a couple more are shown on Page 6. * The ON convoys will be added to individual pages in my Convoys section in due course, with more information on each. In the meantime, the ships sailing in them (and escorts) are named in the section listing ships in all ON convoys. As will be seen, they all had several Norwegian ships. The MKS and KMS convoys will also be added, but for now, please see the section listing ships in all MKS convoys and ships in all KMS convoys (note that the only convoy San Andres took part in was KMS 81). Additionally, the entire HX series will be updated and completed (including the already existing convoys - some have already been updated), ships in all HX convoys has the names of other ships sailing in HX 258 and HX 267. More details on all the other Norwegian ships mentioned on this page can be found with the help of the alphabet index below, or go to the Master Ship Index. Sold in 1958 to to Mohamed Abubakar Bakhashab, Jeddah, Saudi Arabia, renamed Dhahran (Dliahran?). See also this external page. OS/KMS Convoys - As can be seen, San Andres is mentioned in OS 106/KMS 80, but instead sailed in the next convoy. Back to San Andres on the "Ships starting with S" page. Norway had lost a steamship named San Andrés to WW I, built 1911, 1656 gt (D/S A/S Otto Thoresen) - torpedoed and sunk by U-86 in the Bristol Channel on May 11-1918, voyage Barcelona-Christiania via Swansea. This posting to my Ship Forum has some more details.